In order to really benefit from the exercise below, it's important to read some background information so that you can place the exercise within a larger context--one that may be familiar to you. After reading the excerpt from Bounce Back, take the time to set up and do this very simple yet profound exercise. It will help you to transform feelings of entitlement into feelings of empowerment and it will give you a powerful tool that will help you free yourself from the pain of the past and begin to reclaim your emotional life. It's not enough to read this exercise; it is through the doing of this ritual that you will begin to shift away from patterns that do not serve you and begin to reconnect with your bulletproof spirit. One of the most important secrets known to spiritually bullet-proof people is that feelings of entitlement seriously sap the energy necessary to take any hit and come out on top. Spiritually fragile people spend a great deal of psychic, emotional and physical energy reacting to the unfairness they’re experiencing because they feel that they are entitled to a certain kind of life—one without hits that hurt. Spiritually resilient people resist these feelings of entitlement and use all of their energy and resources to do all they can with whatever it is they’ve been given. This one difference in attitude makes a tremendous difference in success and satisfaction and is well-worth cultivating if you want to reap the full benefits of super spiritual resiliency. There is a time in every man’s education when he arrives at the conviction that envy is ignorance; that imitation is suicide; that he must take himself for better, for worse, as his portion; that though the wide universe is full of good, no kernel of nourishing corn can come to him but through his toil bestowed on that plot of ground which is given him to till. Every person on the planet is given a particular “plot of ground” to work with. This “plot of ground” is the entirety of who we are, the relationships we have and the lives we are living. Without a doubt, some people seem to get much better plots! Some people seem to be born holding better real estate and when we’re in default mode, it is very easy to slip into feelings of envy, jealousy and entitlement—all of which seriously undermine our ability to handle the hand we’ve been dealt. Becoming aware of and eradicating a sense of entitlement requires strength, humility and maturity. We’ve seen through our personal and professional experience how threatening it can be to change in this area. When our sense of entitlement is challenged, we can become defensive and angry because we think we’re being asked to give up something that we need. Please be assured that when you move away from your own sense of entitlement, you will find a whole new way of perceiving yourself and your life that will be much more empowering. You may feel entitled to something that you think would have been better for you than what you actually received. For example, maybe you believe that you were entitled to a childhood that was happier or healthier than the one you experienced. You may have spent years and even decades of your adult life resenting your parents and upbringing and being haunted by painful memories, insecurities and fears that you developed as a result of what you lived through. Maybe your adult relationships are affected by what happened when you were a kid. As someone who has done extensive work on healing from and forgiving aspects of my own upbringing, I have a lot of compassion for other people who feel this way about their own childhoods. I truly understand the way that losses during childhood have a profound impact on adult life and leave holes in your heart so big you think that nothing will ever be able to fill them. What I am asking from you right now is that you open your heart and mind to some new ways of thinking about your past that will help you much, much more than holding on to your seething resentments ever will. Carrying around the pain of the past is like trying to live your life with a 75 pound bag of cement on your back. If you really want to put that weight down once and for all and experience how light and free life can be, you must begin to look at things in a whole new way—a way that might seem challenging at first. For many years of my adult life I could not get past feeling that I had somehow been deprived of some of my rights to a happy, carefree childhood and it seemed obvious to me that many of the struggles I faced in my grown-up life were directly or indirectly connected to being deprived of these rights. 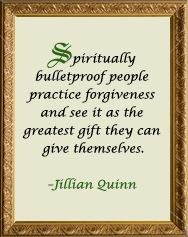 I went to therapy, prayed a lot, meditated and read all kinds of books on forgiveness. No matter how much my mind analyzed and no matter how much I examined things, I could never really let go of the anger, emptiness and sense of loss I felt about certain parts of my past. I felt that I had been deprived of something that I deserved. One day I was at a workshop where I learned the Native American tradition of setting my stones in the medicine wheel. The wise old woman who was teaching the ritual talked to us about our parents, grandparents and ancestors and showed us how to set their stones in the wheel. She talked to us about the importance of honoring these people. One of the other participants asked a question that I’m sure many in the room wanted to ask—what if you don’t feel like honoring your parents? What if they did things that were not honorable? This wise teacher responded in a way that I never expected and that changed me forever. She gave us a stern but grandmotherly lecture about the ignorance of our expectations and the ingratitude and lack of wisdom in our sense of entitlement. She asked some basic questions about our pasts: Had our parents brought us into the world and helped give us the bodies we were living in? Had we been fed? Were we clothed and sheltered? Were we given opportunities to get an education? We all nodded affirmatively to her questions and watched as she shook her head at us. She reminded us of the precious gift of life itself given to us by our parents. She pointed out the many qualities, talents and characteristics our parents had given us as our genetic inheritance. She made clear her sense that to expect more than these abundant gifts was to indulge inappropriate feelings of entitlement. What right had we to question all we had been given and decide that it was inadequate? She compared our situations with those of most of the inhabitants on the earth and throughout history and she asked us how we dared ask for more than we had been given. I felt something soften inside me as I let her wisdom sink in. I began to humble myself just enough to question my own sense of entitlement. Make a point right now to notice how you felt as you read Michael’s story. Did you feel anger seeping up through the cracks? Did you feel resistance to any of his statements? If you experienced negative feelings when contemplating these ideas about eradicating entitlement, that is perfectly normal. You have probably been holding so much pain for so long that your unconscious mind rebels at the idea of letting it go. Eradicating a sense of entitlement, like forgiving the people and situations that have hurt you, seems, at first, like it’s asking you to give something up that you deserve to hold on to or that in some way serves you. Nothing could be further from the truth! If you keep going now—if you push through this initial resistance and keep reading the upcoming chapters and try the techniques they suggest—you will begin to see that you can use these secrets to free yourself from the pain of your past and bounce back completely from even the worst hits. These techniques have worked for us personally and for thousands and thousands of people and they will work for you. Try a new way and see the results for yourself. You’ll need to collect some small stones for this ceremony. Choose one for yourself and one for each person in your family. Try to find stones that symbolize each individual; for example, you may choose certain sizes or colors that strike you as being appropriate for each person. Keep the stones in a small bag or bowl on your nightstand and each evening before you go to sleep, place the stones in your “wheel.” Place your stone in the center and spend a few moments reflecting on something you’re grateful for about yourself or your life. Next, place the stones of your family members, one at a time, around your stone pausing each time to reflect upon one thing that you’re grateful for having received from each person. It may be difficult for you to find something that you feel grateful for but find some little thing to focus on, even if it is just a physical trait you inherited. Think about your physical traits, your talents and natural strengths, the qualities your own children may have inherited, anything that you can find to appreciate. In certain cases, you might find it almost impossible to find something for which to be grateful. Try saying something like “I am grateful to my Mother for giving me the gift of life.” If negative thoughts, memories or feelings pop up as you are setting the stones, practice thought-stopping and stay focused on gratitude. Cut up some small slips of paper. On each slip, write down something you felt or feel entitled to. Maybe you feel entitled to parents who unconditionally support you or to not having any financial worries. Try and be honest with yourself—it’s okay to have feelings of entitlement that you have to release. Be as exhaustive as you can—try to write down anything you feel that you somehow “deserve.” Now, read through your slips and consider the energy you have given or continue to give to these feelings of entitlement. Safely burn all the slips and watch as the smoke from the fire disappears up the chimney or out into the air. Feel yourself releasing these feelings of entitlement and acknowledge that you’re freeing up your energy to better assist you in living your best life now. Buy a small cactus plant or perhaps some stalks of bamboo. Choose a plant that is very hardy in less-than-ideal conditions. (I’ve had three stalks of bamboo that I’ve totally neglected for the last three years and they are growing and thriving. I just change the water in the vase every month or so.) Set your plant where you see it daily and observe its ability to thrive. Know that you are no hothouse orchid— like your plant, you can thrive in any conditions.